Well, if you want to know who is circling the wagons for Rep. John Conyers (D-MI), here’s a very preliminary list. The Dallas Morning News’ Jay Caruso, formerly of RedState, made a compilation video of the various House and Senate Democratic members who refused to say whether Conyers or Sen. Al Franken (D-MN) should resign. Every single member listed below said either it was up to the people of Minnesota, or more commonly, it was up to the ethics investigation to see how this plays out. Well, as we’ve mentioned before, it’s so nice to see Democrats embrace the concept of due process on these matters, though it’s explicitly clear this is due to the political climate, not because they actually believe it. For Franken, well, he’s was first accused by radio host Leeann Tweeden of forcibly kissing and groping her during a 2006 USO tour through the Middle East. Then, Lindsay Menz accused Franken of grabbing her buttocks during a photo op at the 2010 Minnesota State Fair. Two more women accused the Minnesota Democrat of grabbing their rear ends in 2007 and 2008, but spoke to The Huffington Post in the condition of anonymity. The first woman said the incident occurred in 2007 at a Minnesota Women’s Political Caucus event, while the other woman detailed that her encounter occurred at a Democratic fundraiser the following year. Franken has issued a half-baked apology, he said he’s embarrassed, and that he will work to regain the trust of his supporters by staying in the Senate. In other words, he’s a liberal Democrat and feels he can skate by on the Bill Clinton protocol. All of this comes after a relentless attack on Republican Alabama Senate candidate Roy Moore, who is also facing serious sexual misconduct charges, including sexually molesting and assaulting multiple women when they were teenagers. Yet, the Left’s circling of the wagons is a gross display of double standards. Let’s be honest. Conyers will probably stay, as will Sen. Franken. And liberals say that the GOP is the party that wages a war on women. It looks like the Democrats are the ones who tolerate abusers of women. As Katie noted, this is hardly new. Pelosi stepped on a rake by saying Conyers was an “icon” during her Meet the Press appearance over the weekend. 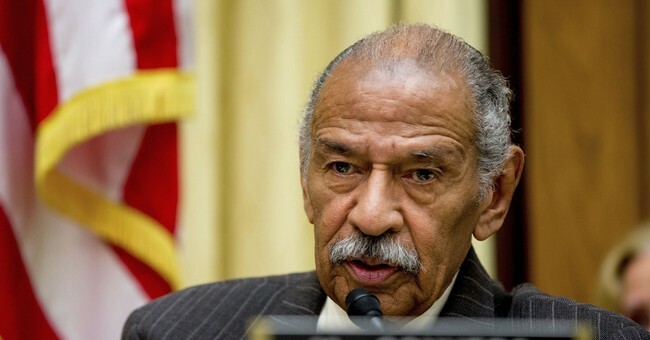 Rep. James Clyburn (D-SC) suggested the allegations against Conyers could be made up. Rep. Speier (D-CA) said she doesn’t know if the allegations are true. The rule remains the same: it’s only bad when the Republicans do it. Nancy Pelosi, who called the Title IX rollback "a shocking attack on women," citing due process in her defense of Conyers is some a-grade high octane chutzpah.